Where it overlaps? Or did he stop in the middle of a door? I think you’ve got a few things going on. 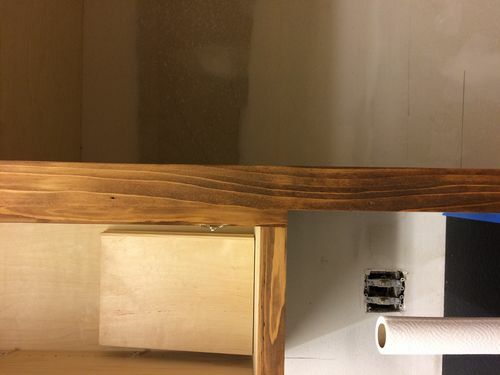 Some wood just is difficult to stain evenly and it gets blotchy. 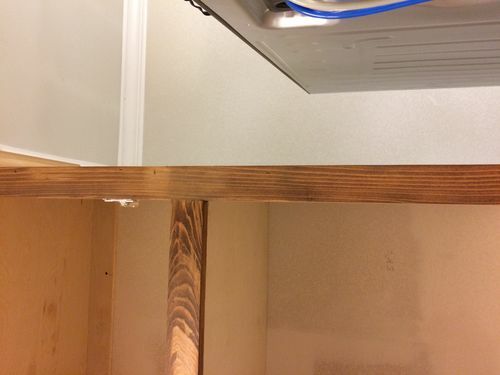 Also, sometimes when areas are sanded more than others, they take up stain at a different rate. You can try a prestain conditioner to help it stain more evenly. It will take up less stain and not get as dark though. That looks like splotching caused by soft and hard grain. You will probably need to sand the stain off and use a splotch sealer. The stain is soaking into the soft grain more than the hard grain. Very similar to staining pine or other soft woods. Cypress is a soft wood and also can be resinous, both of which make staining a crapshoot. I don’t think sanding is the answer. The stain has penetrated so deeply into the soft grain you would have to replane the wood to get rid of it. I think the answer is going to lie in sealing and using a dye. I don’t think it looks horrible so long as its a uniform effect. iF YOU DON’T LIKE IT, DON’T LET IT KEEP MOVING FORWARD, HOPING IT WILL BE FINE. bE CLEAR THAT IT’S TOO DARK AND SPLOTCHY, AND THAT NEEDS TO BE CHANGED. i LEFT MY CAPS LOCK KEY ON BY ACCIDENT, SO ITS ALL CAPITAL LETTERS. wHOOPS. I don t think sanding is the answer. The stain has penetrated so deeply into the soft grain you would have to replane the wood to get rid of it. I think the answer is going to lie in sealing and using a dye. I don t think it looks horrible so long as its a uniform effect. Depending on what product is to be used, your finisher can tint the clear topcoat which might help even out the color somewhat. I’m also on the train that says it’s the way stain works with softwood (blotching). It looks like so far only the face frames have been stained, that might not be as noticeable once the drawers/doors are installed. Tungoil mentioned a tinted clear top coat…that’s known as a toner and is a common way to help even out color. But you may be stuck with you have, I think to avoid having the same thing happen on your doors/drawers you need to test a different approach. Usually this is where “an inconspicious spot” is mentioned…..I’ll go with try it on the door backs, or the drawer backs if possible. 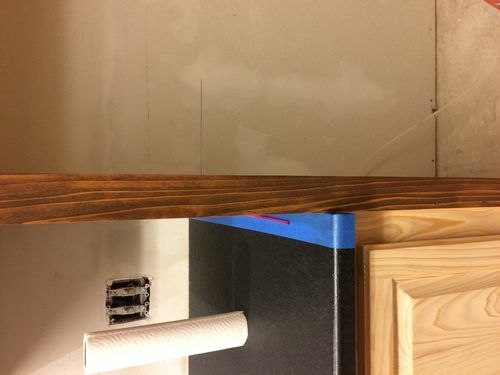 You’re finisher may have a method he uses to prevent the blotching (or not), but a common approach is to first finish the wood with a “washcoat” (simply a very thin coat of finish) and stain over that. It prevents the stain from being absorbed by the wood in varying degrees. Shellac is commonly used as a washcoat.